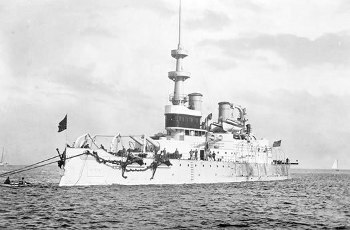 USS Oregon (BB-3) - Veteran of the Spanish-American War. A US Navy pre-Dreadnought of the Indiana-class Battleships. Here is a list of plans and kits for building a model of this historic ship. Kits from Glencoe, Combrig and Digital Navy. The USS Oregon was the first US battleship to be built on the West Coast. This was a clear choice, since she was intended for duty on the Pacific Station. In preparations for hostilities with Spain, she rounded the Cape Horn from west to east in 1898. This was no trivial task as she got stuck in a gale at the Magellan Strait and had to ride it out at anchor in the middle of the night. Her 74-day struggle helped convince the last opposition to build the Panama Canal. She then participated in the Spanish-American and the Philippine-American Wars. Here is a scanned and digitally enhanced General Arrangement plan that could be used for detailing a model of the famous pre-dreadnought. It could also be printed out and hung on the wall or used for educational purposes. 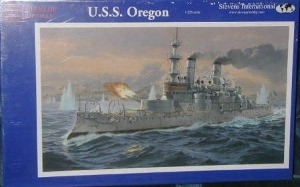 Just as with the USS Maine and USS Olympia Plans, this plan is offered in 1/96 or 1/144 scale. Both these scales are common and often preferred amongst model boat builders. A model produced in these scales is well suited for RC, if that is where your interest lie. 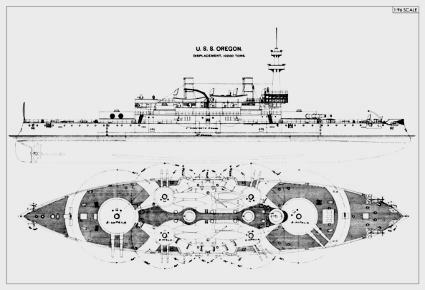 The US pre-dreadnought Oregon, BB-3 General Arrangement Plan. There was a plastic kit by Glencoe of a 1:225 scale that now is out of production. As with the Pyro/Lindberg/Revell kit of the Olympia, it’s crude – but can be brought to look decent if you're willing to put some effort into it such as adding photo etched brass fittings and brass gun barrels. There are a number of illustrated building journals online. There are also photo-etch kits and brass gun barrels. This kit and the brass parts come up on ebay once in a while. Currently the price for the basic kit is around $30-50.00. Combrig is a the largest manufacturer of resin cast model ships in the world. Based in Russia they manufacture high quality resin kits of just about every warship from late late nineteenth century and through both world wars, cold war, through today's navies. Most kits are 1:700 with a healthy offering in 1:350 scale. They have distribution worldwide and sell a 1:700 scale waterline model of the Oregon. YS Masterpieces is a small manufacturer of high quality waterline kit in 1:350. The kit can be bought online directly from the manufacturer. Digital Navy offers a full-hulled paper model in 1:250 scale. It comes with several color options, so you can choose the (almost) all white, white/buff or all-gray paint scheme. It is not an easy kit, but is one of the most accurate.